"Microsoft PowerPoint Template and Background with 3d person standing in the middle of a large question mark" They say appropriate facial expressions aid communication. Our Ask A Question Business PowerPoint Templates And PowerPoint Backgrounds 0611 can be effective too. Your ideas deserve more exposure. Our Ask A Question Business PowerPoint Templates And PowerPoint Backgrounds 0611 will ensure due coverage. 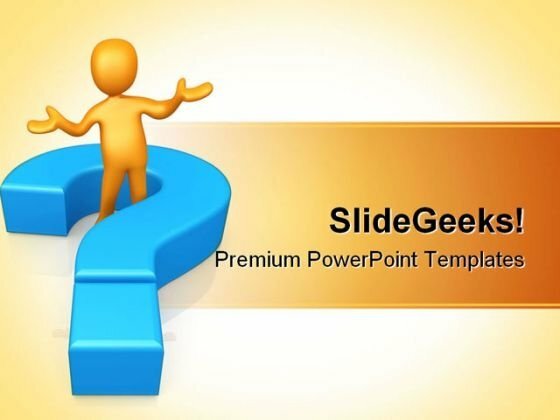 "Microsoft PowerPoint Theme and Slide with 3d person standing in the middle of a large question mark" Intensify growth with our Ask A Question Business PowerPoint Themes And PowerPoint Slides 0611. Download without worries with our money back guaranteee. Give birth to ambition with our Ask A Question Business PowerPoint Themes And PowerPoint Slides 0611. Let your thoughts design a dream. This is a scientific method good ppt example. This is a four stage process. The stages in this process are ask a question, state a hypothesis, conduct an experiment, analyze the results, make a conclusion. You intend to deliver. 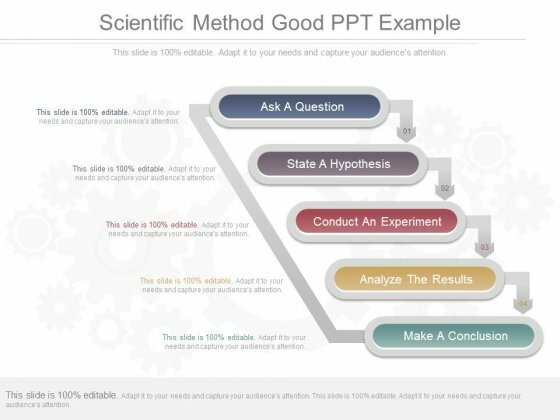 Make it happen with our Scientific Method Good Ppt Example. Make sure your presentation gets the attention it deserves.